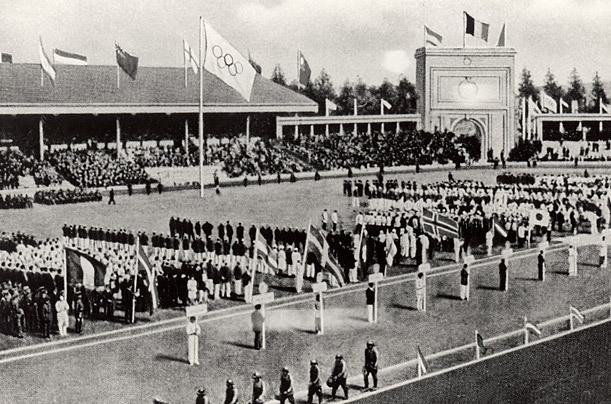 The 1920 Games were awarded to Antwerp, Belgium, in an effort to show that the Olympic spirit could flourish even in a country still reeling from the carnage of the first World War. Belgium's just-defeated enemies  Germany, Austria, Bulgaria, Hungary and Turkey  were not invited, but the 29 countries that did attend the Games sought unity from the very start: the opening ceremonies saw the introduction of the Athlete's Oath  in which a competitor from the host country promises on behalf of all the athletes to play fairly and obey all the rules  and the Olympic flag. Made of five interlocking rings of blue, yellow, black, green and red against a white background, it included at least one color from every nation's flag. Both traditions endure today.